This entry was posted on March 21, 2014 by FS Photography. It was filed under HDR, HDR Processing, Industrial, Kent, Landscape, Nature, Photography, Sunset, UK and was tagged with Evening, FS Photography, Funky Slug, Kent, Lighthouse, Nature, Nuclear, Power Station, Sunset. Nice golden light, and I love how the sun is peeking out behind that stone. I do seethe other one…to the right? At least it looks like a lighthouse….and it looks so small that the one on the left seems even bigger!! Uh huh.. You can seethe all you like. Lol. The light is gorgeous! Nice capture – although the skyline/title seems a little ominous. Great shot, Brian! Good to see you’re back! 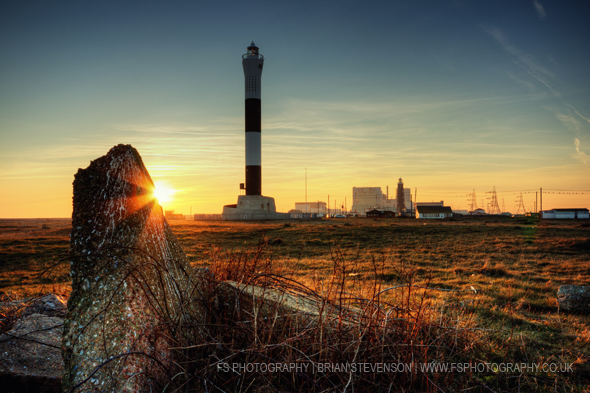 I love the skyline and the contrast with the sun, rock and grass and then the lighthouse and the power station. Amazing! Great image – lovely sense of warmth and depth to it. Dungeness?